You are here: Home / Electric Bike News / E-Bike News: E-Bike Haters?, Super Capacitors, New Mid Drive, & More! Flight E-Bikes is a relatively new e-bike company to join the industry. Find out more about their bikes here. Electric bikes are hot in Germany. Sales are up 15% from 2011 to 2012. If you will be in the San Diego California area on April 25, 2013, make sure you check out Turbo Bob’s E-Bike Seminar! Here is a new mid drive motor from TranzX called the M25. It is designed with CAN-Bus automotive diagnostics technology. The Burley Travoy is a great addition to any e-bike. It is a serious cargo hauler and it can be used as a shopping cart that you can take with you into a store. Checkout my full review of the Burley Travoy. This is a great video about the CEO of Faraday Bikes and how he got his inspiration for the design of his Porteur e-bike. Paul Willerton reviews the Showers Pass Portland jacket. This is a nice jacket for e-bike riders. Would you or some of your friends be interested in trading in your car keys for 30 days in exchange for an EVELO electric bike? Find out more about the EVELO 30 Day Electric Bike Challenge. I enjoy your Electric Bike Report. 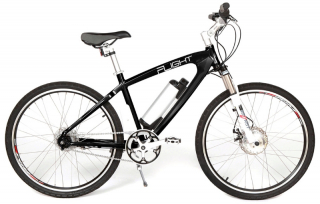 I and a couple of friends are interested in the Flight E-Bike. We went to their web site but could find no information on their dealer locations, and, no mention of price. We are not looking for a $100 bike, nor a $5000 one. I have sent an email,over 12 days ago, to the email listed on their page, but have received no reply. Maybe you can steer us to someplace where we can find this info. I am glad that you enjoy EBR! I have emailed Flight for more info. I will keep you posted on what I find out. I am on the first day of the ebike challenge, hosted by Evelo. It has been a great way to experience ebiking firsthand without committing to the 2k purchase most bikes go for. It has revitalized my desire to figure out a motor for my Sun Atlas cargo bike that has 2.45 wide wheels. Love to hear from anyone with insight into that project.